Model 20 SS Combo Airless Foamer / Sprayer Kit | Lafferty Equipment Manufacturing, Inc. Designed to work with a 2.5 - 5.0 GPM pressure washer. 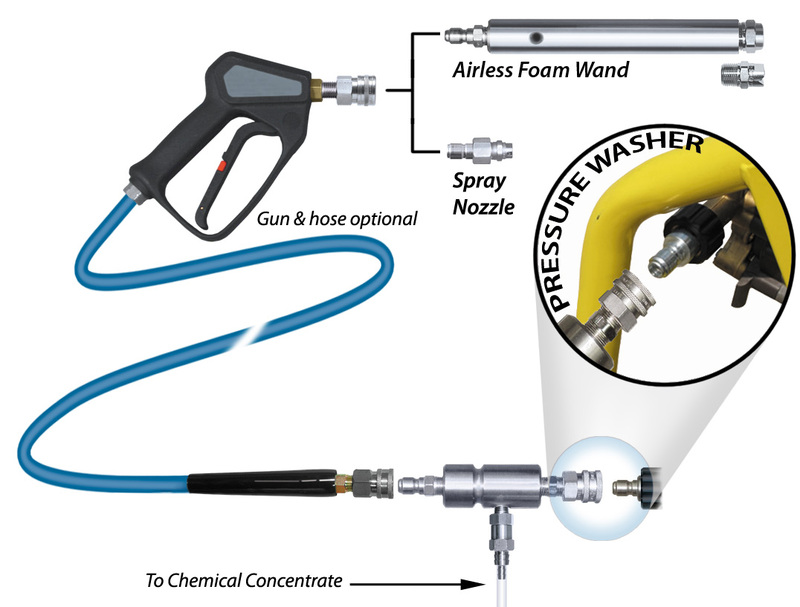 The Model 20 Stainless Steel Combo Airless Foamer/Sprayer Kit is an airless foam and spray applicator featuring a chemical injector quick connected to the pressure washer discharge. This unit draws and blends chemical concentrate into the water stream to create an accurately diluted solution. The solution then flows through the hose and gun to the airless foam wand which injects atmospheric air to create and project wet, clinging foam on to surfaces up close or at distances up to 25 feet. Quick connect the fan pattern sprayer nozzle to apply a chemical spray.